Much to the delight of Star Wars fans worldwide, Lucasfilm put out a second trailer for the eagerly-anticipated Star Wars: The Last Jedi movie. And fans will be thrilled by the fact that this trailer reveals way more of Disney’s upcoming movie than last April first official trailer, giving us a peek at what mayor characters like Kylo Ren (Adam Driver), Rey (Daisy Ridley) and Finn (John Boyega) will be up to in director Rian Johnson’s upcoming movie. Some would say, though, that this trailer gives a bit too much away. Actually, director Rian Johnson himself advised viewers in a tweet to stay away from this second theatrical trailer due to its spoilery nature, only to withdraw his words later on. Nonetheless, it’s clear this trailer reveals some key plot points and confrontations we will be seeing in the movie, including a Finn and Captain Phasma duel. Finn is seen wielding a lightsabre in this scene, meaning he might have had some kind of Jedi training by this point in the movie, and therefore might be more Force-sensitive than we originally thought… Nonetheless, it will still be great to see Finn turn into a confident warrior and high-ranking Rebel Alliance member, finally becoming the “big deal” he said he was in the earlier The Force Awakens movie. It was also great to see Carrie Fisher’s character Princess Leia in this trailer, and the way she can telepathically communicate with Kylo Ren is a nice touch which echoes Luke’s mental bond with Darth Vader in The Empire Strikes Back movie. This will likely be Leia’s last appearance in a Star Wars movie, and hopefully Carrie Fisher’s last film role helps make this movie a great experience for Star Wars fans. Of course, it’s clear that the central figure in The Last Jedi will be Rey, and her training with Luke Skywalker on that remote island where she finds him at the end of The Force Awakens will likely take up a good portion of the movie’s running time. But although we finally get to see actor Mark Hamill play the Skywalker role again, I’m not convinced his performance will be as good as Alec Guinness’ was in the original Star Wars judging by what I’ve seen of him in this trailer. 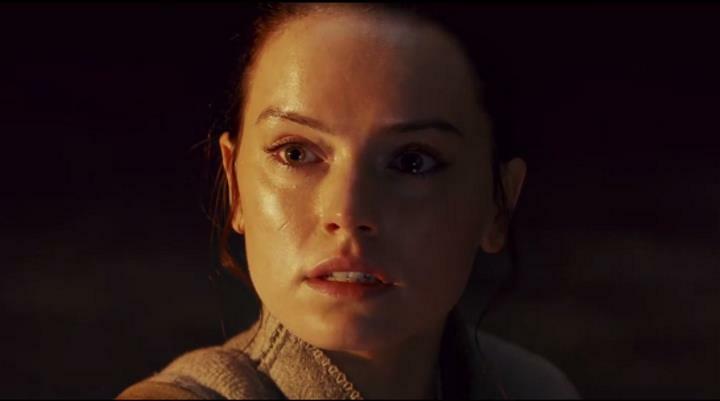 Hopefully, though, Daisy Ridley will be better than in The Force Awakens, as in that movie she wasn’t that great in her reluctant heroine role. Also, this trailer gives away a big plot point, and that is that Rey could end up forming an alliance of some sort with baddie Kylo Ren… So, does that mean that our pious and brave heroine will be seduced by the dark side in this movie? The trailer shows her sharing a scene arch-villain Supreme Leader Snoke, so this is a very real possibility. It’s hard to say at this point, though, whether Star Wars: The Last Jedi will come close to 2015’s The Force Awakens and last year’s Rogue One: A Star Wars Story. But what’s clear is that this will be a major box office success either way, and it’s difficult to imagine that this won’t turn out to be one of the biggest movies of the year when it hits theatres this December.